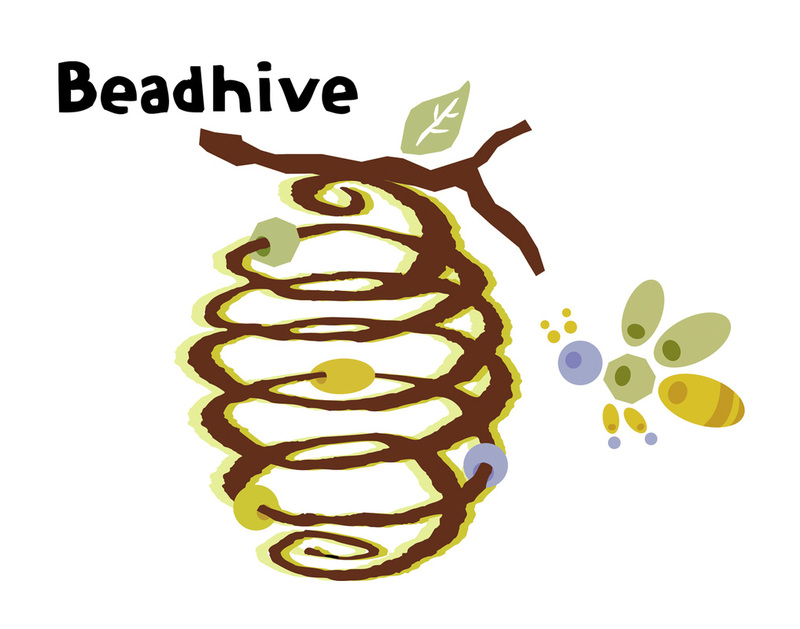 Take a class at Beadhive! 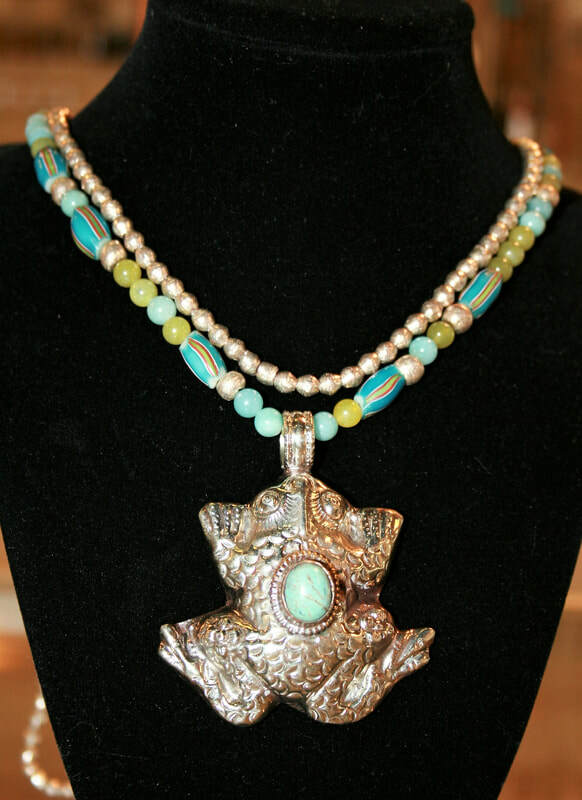 We offer classes for all interests and skill levels, from stringing beads to intricate wire work. Our instructors are seasoned professionals who love their craft. Each class is limited in size so students get individual attention. Call or stop in the store to register for classes, including free classes. Please plan to arrive at least 20 minutes before class! Class time does not allow for the selection of supplies. See bottom of this page for cancellation policies. These classes are *FREE with the purchase of your class supplies at Beadhive! No experience needed! Students will learn all about the tools, beads, and findings (clasps, crimps, etc) needed to make their own custom-crafted bracelets and necklaces! We'll teach all the basics of bead stringing plus share handy tips and tricks to ensure students go home with their well-made, original creations. Learn to make perfect simple wire loops on each side of a bead. Then link them together, or add sections of chain between the beads for a necklace or bracelet. The looping technique is one that you will use over and over again for earrings, pendants, and much more! What are cones and how do you use them? Make a multi-strand bracelet or necklace! Students will learn how various sized beads and chain can be mixed and strung together, how to determine the best cones to use for their project, and how to add the bead strands to the cones for a tidy professional finish! Relax and unwind while making a beaded wrap bracelet. Easy and fun, this wire keeps it's shape and has no need for a clasp. Bring the kids, grab a friend! Add charms to the end of your wrap and learn how to finish your customized accessory. Make a ropey, colorful accessory with soft cording and large hole beads. Add knots to several strands of your creation for a perfect casual accessory. Use as a necklace or a wrap bracelet! Receive 10% off all purchases the day of class! Suncatchers are an easy peasy way to catch some rays this winter. An array of faceted glass and crystals will reflect the warm sunshine into your home, and lift your spirits. Play with wire-working, hammering metal, and crimping styles - all to make this fun design. Attend this class for an easy-to-learn silk knotting technique, and the proper way to handle knotting tweezers. Learn how to make knots that you can incorporate into Mala necklaces, classic bracelets, and more. You need knot worry about knotting after this informative class! Learn how to transform a pile of wire into sturdy bangle bracelets. Size your bangle to your preference and securely wire wrap stones, pearls, or crystals to the bangles. Make two or more in class. Stack them for maximum appeal! Create an easy, eclectic, free-form wire cage to enclose a rock of any shape. Create a loop to hang your wrapped rock. You'll want to wrap up every stone you find! Great classes for beginner to intermediate students. Receive 10% off all purchases on day of class! Learn lots of valuable beading techniques in just two hours! Students will learn to turn beads into pendants with head pins and eye pins, how to make simple and wrapped wire loops, how to attach beads to chain, and attach chain to leather with cord ends! Plus, learn how to make an adjustable sliding knot on the leather. Terrific, indeed! Learn how to make this ever-popular bracelet design! Choose beads in stone, glass, or metal and lasso them between leather strands with a button clasp. Fancy Wire Wrapped Rocks $25. with a finished pendant that is sure to impress! Take those leather and bead wrap bracelets outta this world! Learn how to make a chevron pattern with two-hole beads, a zig-zag pattern, and the classic one bead pattern - all stitched nicely between soft leather strands. Class time allows for one to two wraps, but all finishing techniques will be taught! You'll love this earring workshop! This class requires no previous experience to learn all the tips and tricks to create unique, custom earrings. Learn simple-wire loops, wrapped- wire loops, and top-drilled wire loops. Learn how to incorporate chain, bead caps, charms, and more into your designs. It's everything you need to know to make earrings! 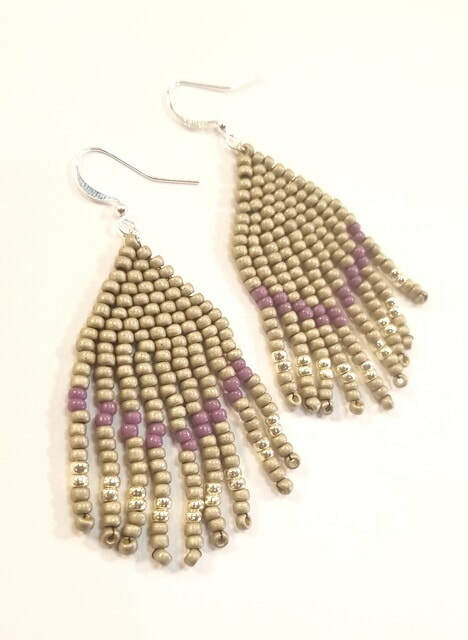 Beaded Earrings with Fringe $25. These addicting-to-make earrings are fun to learn! Use larger hole seed beads for a visually easy way to create these earring pieces. Learn brick stitch and how to attach beaded fringe to your designs. Color patterns and length are up to you! 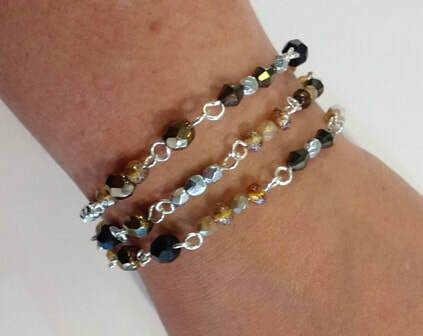 Use 2 hole Super Duo's and glass seed beads to create this lovely pattern.No stitching experience required to create this visually stunning and texturally pleasing bracelet.